Exactag does not collect personally identifiable data such as your name, email, address or phone number from your visit to its servers and domains, including but not limited to www.exactag.com, m.exactag.com, pxc.otto.de and adtracker.eanaylzer.de, unless you voluntarily supply this through e.g. the contact form or any other publicly available contact channel. If doing so, you agree that your contact details are correct and rightfully yours. They will be used solely by Exactag to respond to your query. To ensure online privacy, Exactag complies with the EU General Data Protection Regulation (GDPR). Exactag’s technology is used by its customers—ad agencies and advertisers—to measure the effectiveness of online marketing campaigns. It allows advertisers to collect and store data about Internet users (devices) and use them for analysis and marketing attribution purpose. When you visit a website or mobile application that shares non-personal information about your activity with Exactag, we will use that information to help our clients to understand the impact of their advertising activities. Exactag uses a cookie mechanism for this purpose, but only on an anonymous basis. A cookie is a small text file that can be stored on a computer or mobile device when, with a browser, a user views advertisements or websites of one of Exactag’s clients. The cookie does not collect names, addresses, telephone numbers, email addresses, or anything similar that identifies an individual (according to EU laws, personal data is any data that „directly and indirectly“ identifies a person). Instead the cookie contains: a random identification number, opt-out or opt-in choice options, or information about campaign activity on an advertiser’s site. Using the cookies’ random identification numbers, Exactag collects and stores in the cookie-based profiles anonymous information such as: device type, operating system, browser version, geographic location, or facts about interactions with advertisements (such as number of clicks or views). During web requests to Exactag web-servers, our system is exposed to the IP addresses of user devices. Exactag is in full compliance with local data privacy laws and is not only anonymising the data according to local regulations, but even deletes it. Exactag implements reasonable security measures to protect all data collected and used by Exactag technology. At every step, Exactag adapts all relevant security and safety practices, and employs modern security hardware and software provided by recognized world-leading manufacturers. Physical environment security is also ensured; thus, Exactag solutions are hosted and data are stored only in Tier III+ data centres, classified according to official data centre classification. The opt-out process erases all previously collected data and places an alternative Exactag cookie into the Internet user’s browser with special indication of an “opt-out” choice and with no other data. The cookie applies to the specific computer or mobile device and browser only. If an Internet user wishes to opt out on other browsers, computers or mobile devices, he or she must repeat the process. Please also note that if all cookies are erased from the computer or mobile device, the opt-out cookie is also erased and the process must be repeated. The cookie installed by the process of the objection, so called “exactag_new_optout”. You can revoke your consent for the data to be processed or object the data processing on the basis of Art. 6(1)(f) GDPR at any time by clicking here. Right to access, rectification, right to object, to complain, erasure and blockage. You have the right to request information about whether and which personal data is processed by our company. You also have the right to demand that your personal data is rectified or amended. Under certain circumstances, you have the right to request that your personal data should be deleted. Under certain circumstances, you have the right to demand that the processing of your personal data should be restricted. You can withdraw your consent to the processing and use of your data completely or partially at any time with future application. You have the right to obtain your personal data in a common, structured and mechanically readable format. We will inform you, upon request, which data we have stored about you. To access, update or delete information about you please contact us, as described above, quoting on whom (company) you found out about us. We will process your request as inquiry as possible. To enable us to optimise our website and our service, we use Google Analytics, which is a web analysis service provided by Google Inc. (“Google”). Google Analytics uses what are known as “cookies”: these are text files stored on your computer and used to analyse your website usage. The information generated by the cookie about your use of this website (including your IP address) will be sent to a Google server in the USA and stored there. However, if IP anonymisation is enabled on this website, within member states of the European Union, or in other states that are party to the agreement on the European Economic Area Google first abbreviates your IP address. The full IP address will only be transmitted in exceptional circumstances to one of Google’s servers in the USA, where it will then be abbreviated. Google will use this information on behalf of our website operator to analyse your use of the website in order to compile reports about website activities for the website operator and to perform other services connected with the use of the website and of the Internet. The IP address transmitted by your browser as part of Google Analytics will not be merged or combined with other data by Google. You can prevent cookies from being stored by applying the appropriate settings in your browser software; please note, however, that in this case you may not be able to use all of the functions of this website to their full extent. link tools.google.com/dlpage/gaoptout?hl=en. As an alternative to the browser add-on or within browsers on mobile devices, please click on this link to prevent Google Analytics from collecting data in this website in future (the opt-out only works in this browser, and only for this domain). This stores an opt-out cookie on your device. If you delete your cookies in this browser, you need to click on this link again. Further information is available at tools.google.com/dlpage/gaoptout?hl=en or at www.google.com/intl/en/analytics/privacyoverview.html (general information on Google Analytics and data protection). With regard to the cookies that the social media parties install and any data they thereby collect, please refer to the statements that these parties have published on their own websites. Beware that these statements may regularly change. Exactag has no influence in this respect. The “XING Share Button” is installed on this website. 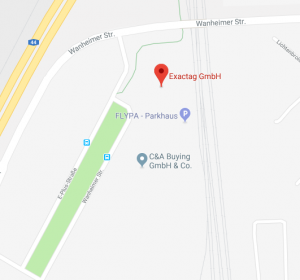 When accessing this site, your browser will briefly connect to the servers of XING AG, Dammtorstraße 29-32, 20354 Hamburg (“XING”), which establishes the “XING Share Button” functions (in particular the calculation/display of the counter value). XING does not store any of your personal data regarding access to this website. XING in particular does not store any IP addresses. No analysis will be made of your browsing behaviour using cookies in connection with the “XING Share Button”. Current data protection information on the “XING Share Button” and additional information can be found here: www.xing.com/app/share?op=data_protection. If you do not want websites to place cookies on your computer or mobile device at all, you can adapt your browser settings as such that you will be notified before any cookie is placed. You can likewise adapt the settings as such so that your browser refuses all cookies, or only the third party cookies. Likewise, you can remove any of your cookies that have already been placed. Please note that you will have to separately adapt the settings for each browser, mobile device and computer you use. Each browser has a different method to adapt the settings. If necessary, consult your browser’s “help” function, or go to your browser’s manual. Another option for disabling cookies with regard to usage-based advertising is offered by the BVDW preference manager, www.meine-cookies.org/cookies_verwalten/praeferenzmanager-beta.html and the preference management of YourOnlineChoices, http://www.youronlinechoices.com/uk/your-ad-choices. However, we will normally collect personal information from you only (i) where we need the personal information to fulfill our contractual obligations with you, (ii) where the processing is in our legitimate interests and not overridden by your rights, or (iii) where we have your consent to do so. In some cases, we may also have a legal obligation to collect personal information from you or may otherwise need the personal information to protect your vital interests or those of another person. If we collect and use your personal information in reliance on our legitimate interests (or those of any third party), this interest will normally be to operate our platform and communicate with you as necessary to provide our services to you and for our legitimate commercial interest, for instance, when responding to your queries, improving our platform, undertaking marketing, or for the purposes of detecting or preventing illegal activities. We may have other legitimate interests and if appropriate we will make clear to you at the relevant time what those legitimate interests are. If you have questions about or need further information concerning the legal basis on which we collect and use your personal information, please contact us by sending an email to privacy@exactag.com. if you have consented to this as part of processing, until such time as you withdraw your consent, may not be deleted in order that the consent/opt-out to remain effective. if we need the data to undertake an agreement, until such time as the contractual relationship with you ceases or legal retention periods expire. if we use the data on the basis of a legitimate interest, until such time as your overriding interest obliges us to delete or anonymise them. We have taken extensive technical and organisational measures to secure your data against potential risks, such as unauthorised login or access, unauthorised perusal, amendment or distribution, as well as against loss, deletion or misuse. You can contact our data protection officer(s) at privacy@exactag.com.